Henry VIII. had been dead some two hundred years before the Master Crewe of our picture was born, but English kings are not allowed to be forgotten. 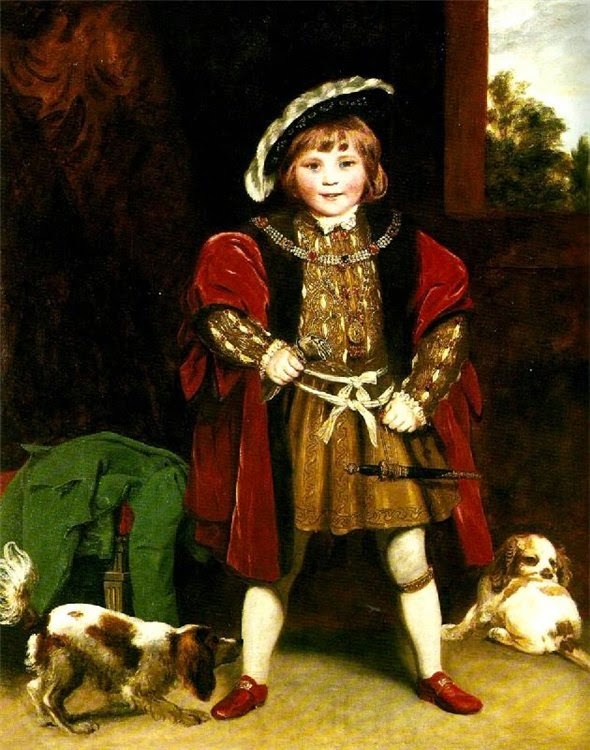 Successive generations of children were shown Holbein’s portraits of the bluff old ruler, and were taught something about his reign. It happened one time that the children of Master Crewe’s acquaintance had a fancy dress party. The Crewes were people of fashion who entered constantly into social affairs. Naturally there was much discussion over their son’s part and costume. It was a happy thought which fixed upon the character of Henry VIII., for the boy’s round face, square shoulders, and sturdy frame were well fitted for the rôle. Evidently no pains were spared to make the costume historically correct. Holbein’s portrait was the costumer’s model, and every detail was faithfully followed. The boy is dressed in the fashion of the sixteenth century in “doublet and hose.” This consists first of a richly embroidered waistcoat, the most effective part of the dress. The sleeves are made of the same material and are gathered at the wrists in a ruffle. The lower part of the doublet is a skirt falling just above the knees. Over all is flung a handsome mantle; but this is drawn apart in front to display the smart waistcoat to full advantage. A broad-brimmed hat set jauntily on one side, and trimmed with a long feather, completes the costume. By way of ornament is worn a big jewelled collar and a long chain with locket. A short sword swings from the girdle, and on the left leg is the garter, which is the badge of membership in the ancient Order of the Garter, of which Henry VIII. was the tenth sovereign member. This is of dark blue ribbon edged with gold, and bearing in gold letters the motto “Honi soit qui mal y pense”. It is one thing to have a perfect costume, and another to understand the rôle. Master Crewe not only looks his part, but he acts it as well. He has not failed to take in all the points of the portrait, and imitates the pompous attitude to perfection. He stands with feet wide apart, grasping his gloves in the right hand and supporting the other on the sash. He is a bright boy, who enters into the spirit of the game, and it tickles him hugely to play the part of a despot. But while he is Henry VIII. in miniature, he is Henry VIII. without the king’s coarseness, and in the place is a child’s innocent pleasure. It was no wonder that his parents, delighted with the success of the costume, wished to have a portrait made. The boy is painted as he appeared when posing for his admiring friends. In his effort to assume a lordly air his boyish glee gets the better of him, and he belies the character by a broad grin. Perhaps he has caught the twinkle in his father’s eye, or his mother’s suppressed smile, and he can keep serious no longer. “Bravo!” cries the audience, and he smiles in innocent delight at his success. His pet dogs are in the room, and one of them is rather suspicious of this strange young prince. He sniffs cautiously at his legs, for though his eyes deceive him, his sense of smell cannot be mistaken. Through a window in the rear we get a glimpse of the park beyond, which adds much to the beauty of the picture.